Free Shipping Included! Cotton Candy Floss Sugar-Blue Raspberry, Pink Vanilla & Cherry- 3.25 lbs. (3 pack) by Gold Medal at Baking Love. MPN: 3218VP1. Hurry! Limited time offer. Offer valid only while supplies last. Gold Medal Flossugar. Combination pack includes 1 carton of each of the following most popular flavors: Blue Raspberry, Pink Vanilla, and Cherry. Gold Medal Flossugar. Combination pack includes 1 carton of each of the following most popular flavors: Blue Raspberry, Pink Vanilla, and Cherry. Pre-Mixed & ready to use for perfect cotton candy EVERYTIME! 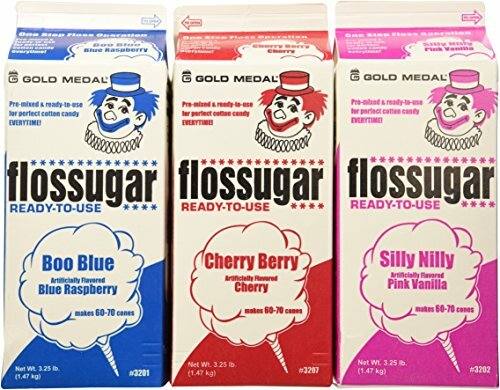 Gold Medal Flossugar is made from special sugar that is not too fine, but not too coarse. It's been "vividized" to provide bright, vibrant color (Concentration does not exceed FDA limits). (3 of the 3.25 lb. cartons / case) Disclaimer: Product will differ slightly from picture. 1 carton of each of the best selling flavors! If you have any questions about this product by Gold Medal, contact us by completing and submitting the form below. If you are looking for a specif part number, please include it with your message.